Dangal, the recent box office hit starring Aamir Khan, has already grossed over 700 million INR,becoming the highest grossing Indian film. Based on the life story of Geeta Kumari Phogat and Babita Kumari Phogat, winners of gold and silver medals in wrestling in the Commonwealth Games 2010, the movie claims to portray ‘female empowerment’ in a male dominated sport. But how long do we have to see women grow and succeed under the protection of men? The film sparks such questions of patriarchal control at multiple instances. The first and foremost is the way the father, Mahavir Singh Phogat played by Aamir Khan, imposes his dreams on the reluctant daughters. This imposition—which includes restricting their favourite foods to cutting their hair—is made after the girls, Geeta and Babita, beat up two boys. Physical supremacy of the girls is determined through the emasculation of the two boys who cannot even compete with ‘girls’. Thus, their identity as girls does nothing to their father’s decision of training them as wrestlers. Their continuous protest against the rigorous training given by their father goes in vain as they are made to believe by their friend who is a victim of child marriage that at least their father thinks of their futures. This scene validates the task given to the two sisters. The father is accepted as the obvious benefactor who withstands protests and taunts of the society and makes his daughters wrestlers. In the entire movie no one asks the girls what they want to become. Man is considered the touchstone of power. Hence, to prove their prowess, Geeta and Babita subsequently fight against their cousin brother and the strongest of the male wrestlers rather than any girl. The hypermasculine location of the wrestling ground is controlled by Mahavir Singh Phogat, the ultimate patriarch. In order to belong to this place, it is not only the sisters who have to struggle, their lanky tall and weak cousin brother also becomes a victim. From a punching bag to a cook, this brother undergoes the eventual emasculation in the hands of Mahavir Phogat. It shows how both men and women are subject to patriarchal control. 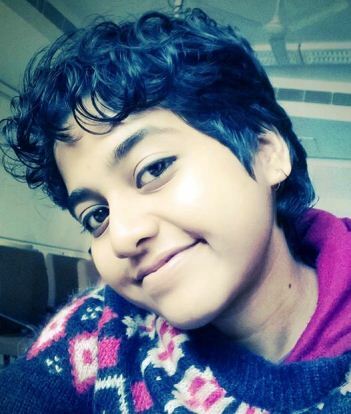 Critique of femininity is evident in the film in the portrayal of Geeta’s life in the hostel. At the training centre she goes out with her friends who tell her that it is OK to keep long hair, eat what she wants, and watch late night romantic comedies. But these ‘funs’ are nipped at the bud as they are seen responsible for her successive failures at international matches. It is only when she cuts her hair and goes back to her usual routine that she succeeds. 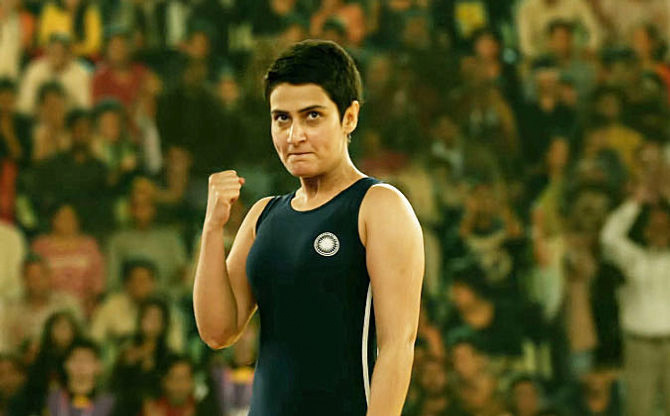 Apart from the physical conflicts on the wrestling mat, the biggest emotional tussle of the movie is shown through disputes regarding Geeta’s life choices, as well as her choice of technique-oriented wrestling as taught be her coach. Interestingly, this is perhaps the only instance in the entire film where Geeta exercises her choice and speaks out. But she is quickly shunned for hurting her father and her repeated failures prove that her ‘choices’ were indeed wrong. Geeta’s failure is almost necessary to retain the balance of control of a single man. The gendered aspect of this evident is striking. In Indian society women are supposed to perform three roles in their lifetime—as a daughter, a wife, and a mother. And in all three stages she is controlled by the father, husband and son respectively. By making Geeta, the daughter, submit to her father’s wish and proving that her own good lies in this submission, the male control is reestablished. Geeta in the end is shown as a good daughter who obeys her father in every way possible. The film thus appears with more dungeons than dangals. During the final match at the Commonwealth games, Geeta feels confused and disconcerted without her father who used to shout instructions from the audience seat. Although she wins gold with her father absent during that game, there is subconscious presence of the father in Geeta as she hears his advices in her mind. Ultimately then, it is the victory of the father who surpassed the criticisms of the villagers to make his daughters wrestlers. In such scenario one wonders what would have happened if their mother wanted them to be wrestlers. How would the society treat her then? What would have happened if the girls wanted to be wrestlers? Would they succeed to defy gender norms and norms of masculinity and femininity without the help of any man? Would Mahavir Singh Phogat have supported their ‘choice’? The film only forces us to raise these questions, and as of now they remain unanswered.